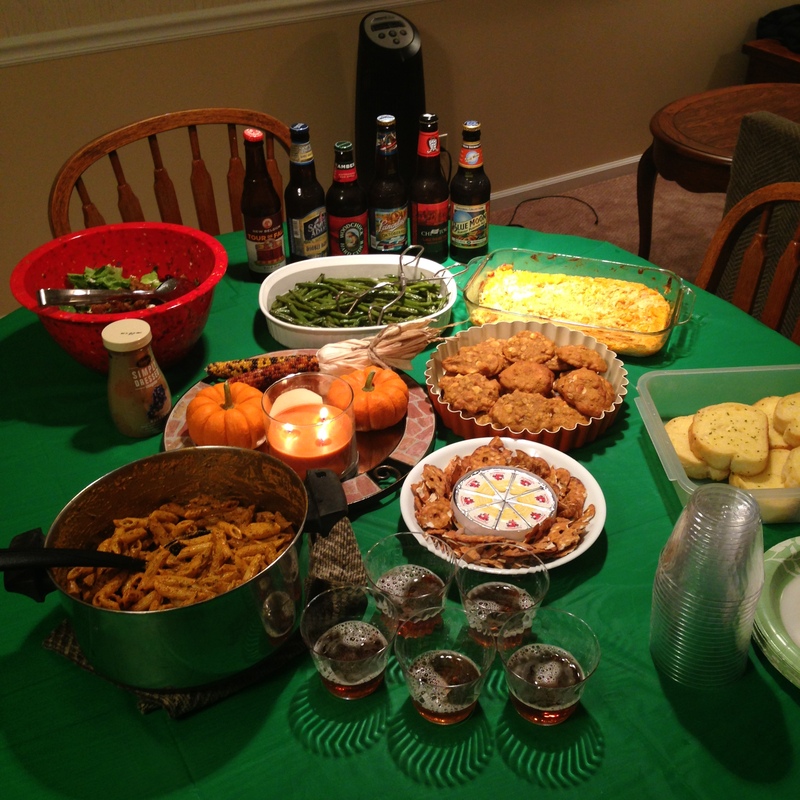 Seeing as fall officially arrived on Monday night, it was a perfect night for a potluck dinner. Since it’s tricky for my friends and I to all get together these days, we got really lucky and got a good majority together for the Bears game, to eat some great food and sample some seasonal beers. It was delicious – roasted red pepper pasta, garlic bread, roasted green beans, buffalo chicken dip, salad with craisins/walnuts/blue cheese/vinaigrette, and white chocolate macadamia nut cookies. It was a feast. Plus the Bears won! 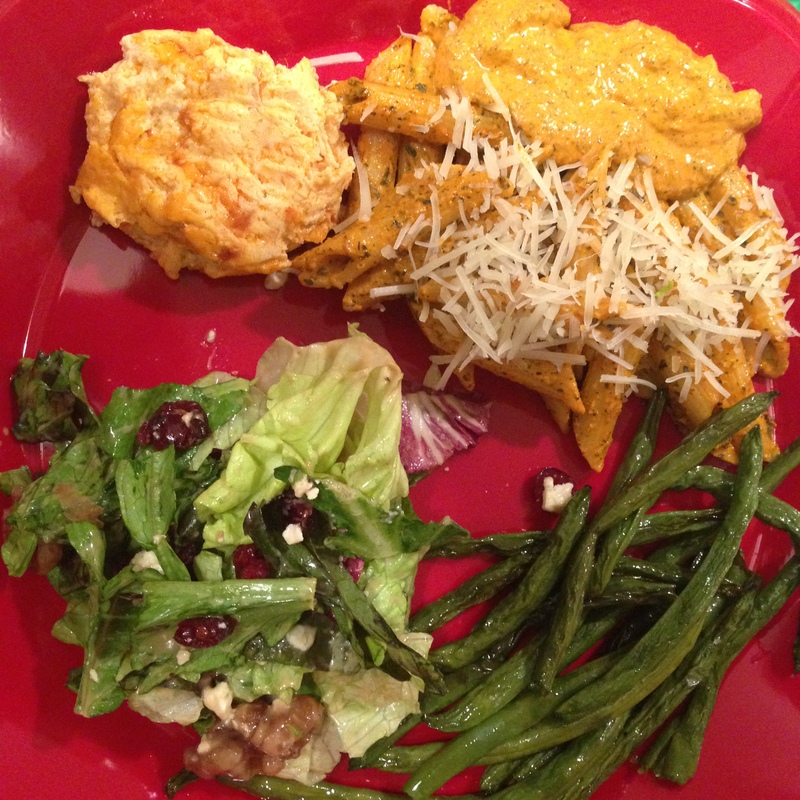 Plate one – I finished off the salad and had lots more buffalo chicken dip. It was just too good! I actually don’t like buffalo sauce but for some reason when it’s in dip form I just can’t get enough. 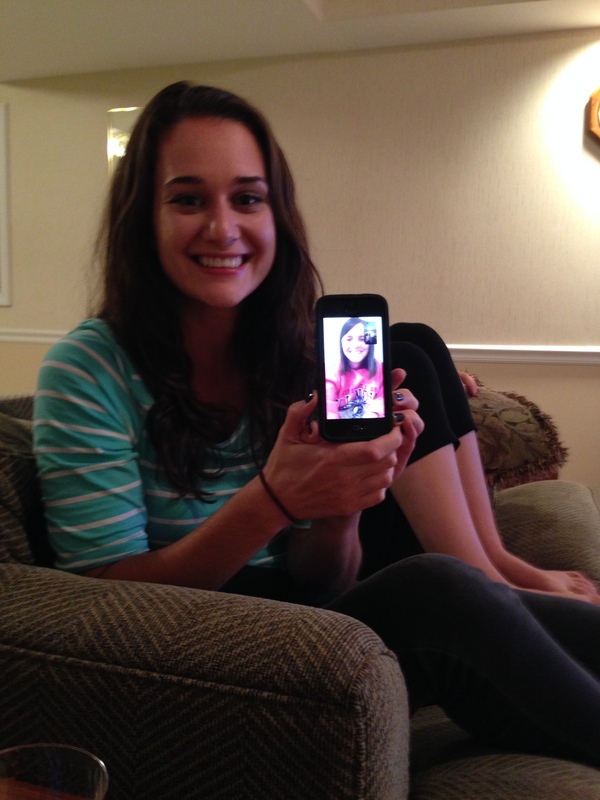 We also FaceTimed our friend Jordan in who is currently living in Arizona. Oh, technology these days. Is it bad that I have more fun at these kinds of get-togethers than I do going out on a Saturday night? I’m sure if anyone understands it’s you guys! I contributed the cookies and salad. Cookie recipe below, courtesy of Closet Cooking, with just a few very minor tweaks. 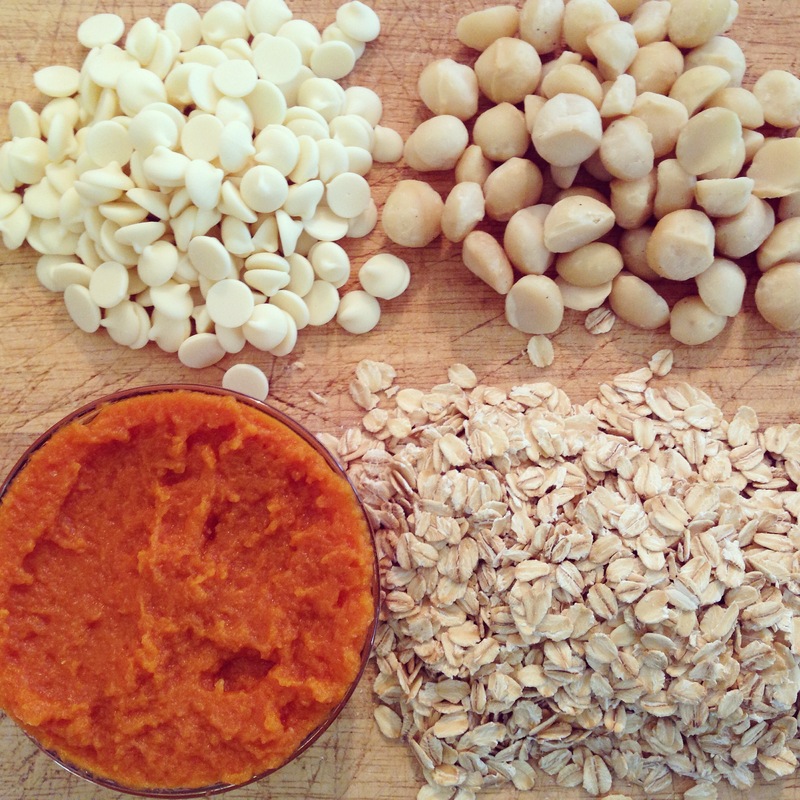 Mix in the rolled oats, white chocolate and macadamia nuts. Place the dough onto a cookie sheet one table spoon at a time. Bake in a 350F preheated oven for 8-10 minutes. Do you have a go-to dish to bring to potluck dinners? Do your friends all live close by or all over the country? I got really lucky that my friends from college live within 45 minutes of me! Haha we still have our potlucks at our parents’ houses…in the basement no less! 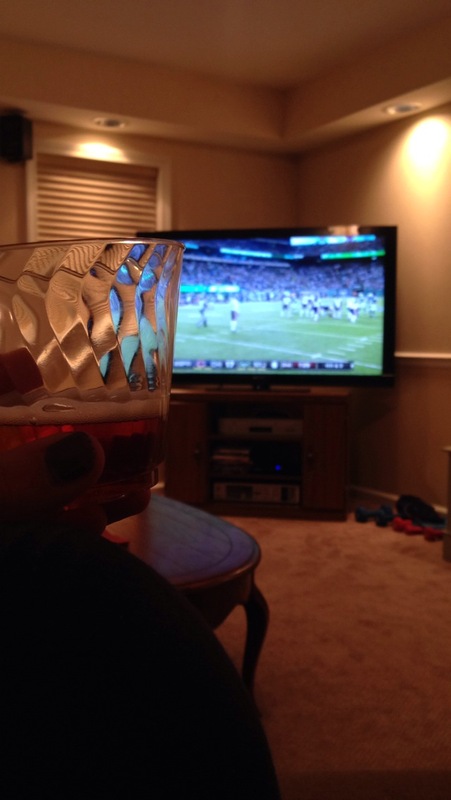 We all live at home – no shame at ALL! Saving money is so important! First of all, I must tell you that the cookies look great and easy to be made so I will definitely try to make them during the weekend! My boyfriend loves white chocolate so I think that even he will be satisfied with this quite healthy recipe. 😉 You are very lucky that you live near your friends from college! I moved to Toronto so we don’t see each other very often. However, I found new friends here who I love very much, but it’s not like with the college friends with whom I went through a lot during university years, you know? 😉 When my college friends come to visit me, I always try to show them the nice places here, take them to eat out in the city, etc. You can see some of the patios that we visit so that you can create the picture in your mind. I found this list when I wanted to take my friends out and didn’t know the city quite well. About the potluck dish, I usually prepare muffins, brownies or a cake because I like baking so my friends count on me that I will bring something sweet 😉 Thank you for the cookie recipe once again! I love potluck dinners- I used to go to one every festive time back in Melbourne! These days it’s a potlock brunch and by potluck it’s potluck for my friends and I, the chef. lol. Buffalo chicken DIP? Okay, I need to google this beauty. Potluck brunch sounds AMAZING…i love potlucks and I love brunch, how have I not thought of this?! Aww looks like such a fun night! I love nights like that, chilling out with friends, relaxing, eating, drinking and having such a laugh! My uni friends are spread all over the country! You are so lucky to have yours near by! But we have made quite a few friends since moving to Glasgow, thanks CrossFit! Crossfit is an awesome way to make friends in a new community – that’s so lucky. Haha idk if I could handle hosting a whole buffet for people! I miss a good ol potluck. My friends are all over the country (and you’ve seen how difficult it is to corral everyone here! ), so it is pretty difficult. One of my go-to recipes for potlucks are my jalapeno chedder cornbread muffins. I make half spicy and the other half plain. Always a hit! Omggg that pasta looks amazing!! Probably because I am starving and it’s only 7AM haha. I love potlucks with friends. That’s how I celebrated my birthday a few years back and it still stands as one of my best! I always try to go out for my birthday and am always disappointed. I think it’s time to try a new potluck bday tradition! I’d be so much happier 🙂 it’s so much more “me.” Great idea! 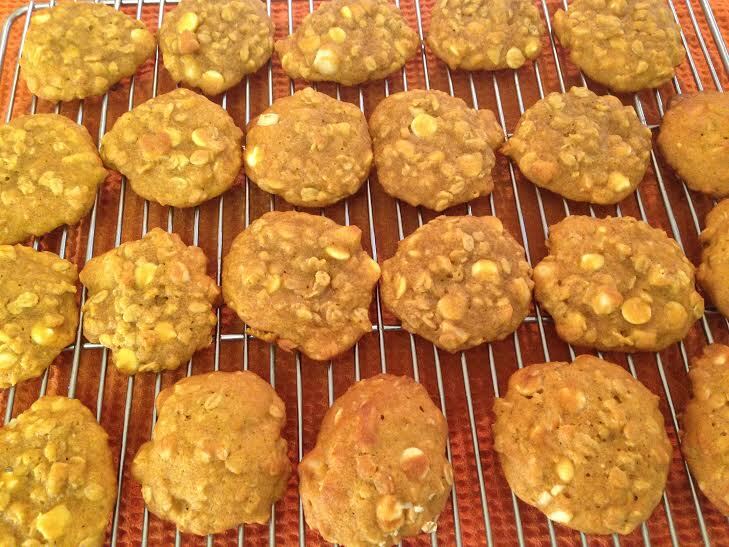 Oh my those pumpkin cookies…..yum! My favow seasonal drink is probably the pumpkin spice latte from starbucks. I don’t get it often because I’m sure it is so bad for you, but so delicious! Hey it’s all about moderation, right? 🙂 I like pumpkin spice creamer better but I use it every day now so….it’s not a latte but it’s definitely not healthy! I love night like that – they are a lot of fun. These sound delicious too. Yum! I LOVE potlucks! I haven’t been to one in ages! cookies sound delicious- I love the pumpkin in them! Potlucks are so much fun. I usually only have them with people I work with, but they are like my family so that’s fine by me!! OHH those cookies…swoon. That’s so great! My coworkers are becoming my family too and it’s the best because you get to be surrounded by so much love all the time! Those cookies look amazing! So yum! I’m a big fan of pumpkin coffee in the fall. My friends actually live all around the world so it makes it hard to see everyone regularly! Ugh, most everyone I love lives all over the place. My best friend is in NYC, boyfriend in LA, and three of my other closest friends are in Cinci, Chicago and DC! Lots of frequent flyer miles over here. You had me at pumpkin cookies YUM! But that beer line up is impressive! Agreed! We do samplers for superbowl. 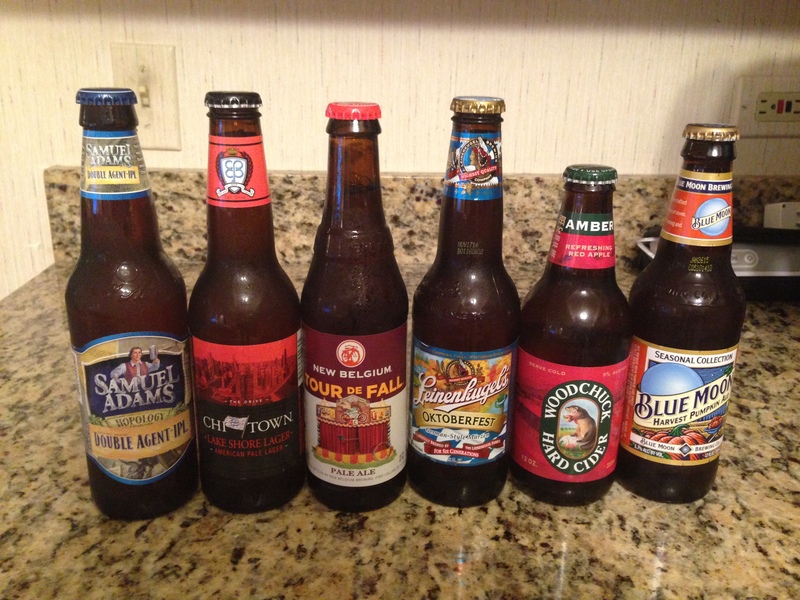 It’s fun to try sips of different flavors!